Billboardom : Gallery of billboards, signage and other outdoor advertising. Pop music videos made from recut Sherlock Holmes TV show : woman named Mary Van Deusen creates videos for old pop songs by recutting footage from the old Sherlock Holmes Granada TV series starring Jeremy Brett. This is practically the definition of "magnificent obsession" and some of the cuts are nothing short of genius. UK gags paper over Aljazeera memo : Britain's Daily Mirror newspaper has been ordered to cease publishing further details from an allegedly top secret memo revealing that US President George Bush wanted to bomb Aljazeera. Channel 4 censured for running too many adverts during 'Lost' : When viewers settled down to watch Channel 4's blockbuster drama Lost , they were anticipating an hour of action and intrigue. What they got instead was almost 30 minutes of advertising, sponsor plugs, programme trailers and plot reminders. Viewers were so irritated at the frequency and duration of commercial breaks that many complained. Yesterday Channel 4 was lambasted by Ofcom, the media watchdog, for putting commercial breaks too close together in order to maximise advertising revenue. Bird flu at quarantine centre was discovered only by chance : Ministers tried to cover up the true scale of the fiasco surrounding an outbreak of deadly bird flu at a private quarantine facility in Essex. An investigation by The Independent has found that the discovery of the H5N1 strain of avian influenza at the centre occurred by chance. Senior officials and ministers had implied the find was made because of scientific thoroughness. It has emerged that measures designed to alert veterinary authorities to the presence of avian flu failed and it was only the fortuitous death of a parrot from other causes that led to the truth being uncovered. How U.S. Fell Under the Spell of 'Curveball' : The Iraqi informant's German handlers say they had told U.S. officials that his information was 'not proven,' and were shocked when President Bush and Colin L. Powell used it in key prewar speeches. Graham Dean : again, i like his recent work. Link Wray died on Saturday November 5th of heart failure. He was buried on Friday the 17th. : Link is one of rock’n'roll’s all-time greatest guitarists, having been credited with inventing the power chord and influencing countless musicians to pick up and play the guitar. The instrumental bandwagon that dominated rock’n'roll in the late ’50s and early ’60s was led by Duane Eddy and Link Wray. Center for Visual Music : Center for Visual Music is a nonprofit film archive dedicated to visual music, experimental animation and avant-garde media. Hollywood Animation Archive Project Blog : The International Animated Film Society: ASIFA-Hollywood has embarked on an ambitious project to create an animation archive, museum, and library for the benefit of the animation community, students and general public. The first phase of this project involves the creation of a VIRTUAL ARCHIVE which will house images, movie clips and sound files pertaining to the art of animation. 'Schools are irrelevant in a world of digital media' : (independent) Schools are becoming increasingly irrelevant to the modern child as a result of their failure to embrace the digital media, a leading expert on youth culture will warn in a lecture tonight. Outside school, children are said to be engaged in a constant whirl of chatting in chat-rooms and exchanging instant messages with friends. They play computer games - often with people on the other side of the world, download pop and movies. Yet, in many schools, they are taught little more than the rudiments of information retrieval. Compared with the complex multi-media experiences some children have outside school, much classroom work is bound to appear unexciting,'' Professor David Buckingham, head of the Centre for the Study of Children, Youth and Media at London University's Institute of Education will say. Part of the reason for this is their teachers' reluctance to develop the use of new technology in lessons because of inadequate training. ''Given the limited nature of most training, teachers themselves may have good reason to feel incompetent - or at least lacking in confidence - when it comes to integrating technology in the classroom,'' he will argue. Ministers say they have invested £1.67bn in computer technology in schools. Broken bones and broken hopes By Amira Hass : For Palestinians, Yitzhak Rabin is remembered first of all as someone who instructed soldiers to break their arms and legs, when they began their popular uprising against the Israeli occupation in 1987. Before the handshake on the White House lawn, before the Nobel Prize and before the murder, when Palestinians were asked about Rabin, this is what they remember: One thinks of his hands, scarred by soldiers' beatings; another remembers a friend who flitted between life and death in the hospital for 12 days, after he was beaten by soldiers who caught him drawing a slogan on a wall during a curfew. Yet another remembers the Al-Am?ari refugee camp; during the first intifada, all its young men were hopping on crutches or were in casts because they had thrown stones at soldiers, who in turn chased after them and carried out Rabin's order. Protesters throw flowers over the razor-wire fence that separates Spain's North African enclave of Ceuta from Morocco November 5, 2005. Hundreds of demonstrators gathered around the fence to protest against the inhuman treatment the migrants have received from both the Spanish and Moroccan government. Five African migrants died last September 29 trying to climb over that same fence. 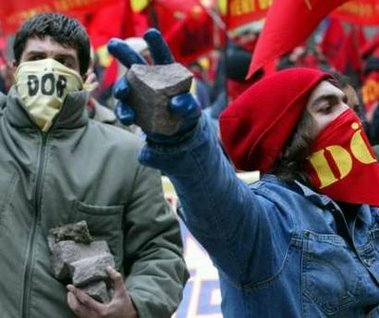 Turkish demonstrators shout slogans as they carry stones in their hands during a protest in Ankara, November 7, 2005. University students clashed with riot police during a protest against the Turkey's High Education Board at the Turkish capital. 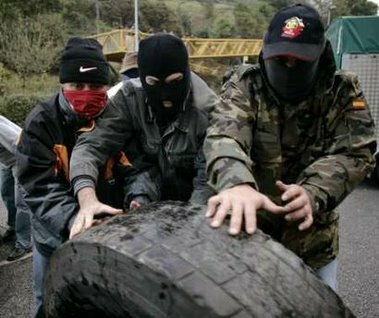 just do it : striking coal miners placing tires onto a barricade on a motorway during a protest near Mieres, in Spain's northern region of Asturias November 7, 2005. 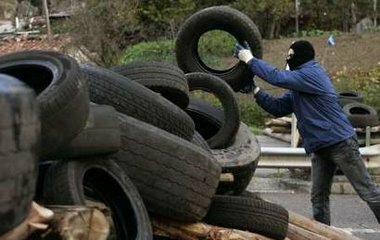 Coal miners, who went on strike last week, set alight barricades on a motorway to protest against the government plans to curb miners' rights to early retirement. Today in Iraq : excellent weblog. "There are some who, uh, feel like that, you know, the conditions are such that they can attack us there. My answer is: Bring 'em on. We got the force necessary to deal with the security situation. “ - George W. Bush, July 2, 2003. Palestinians hit by sonic boom air raids : Israel is deploying a terrifying new tactic against Palestinian civilians in the Gaza Strip by letting loose deafening "sound bombs" that cause widespread fear, induce miscarriages and traumatise children. The removal of Jewish settlers from the Gaza Strip opened the way for the military to use air force jets to create dozens of sonic booms by breaking the sound barrier at low altitude, sending shockwaves across the territory, often at night. Palestinians liken the sound to an earthquake or huge bomb. They describe the effect as being hit by a wall of air that is painful on the ears, sometimes causing nosebleeds and "leaving you shaking inside". IDF prevents Israeli Arab visits to Gaza families : Israel on Thursday prevented dozens of Israeli Arabs from visiting their families in the Gaza Strip for the Muslim Id al-Fitr festival, in contradiction of a pledge the state had made to the High Court of Justice. But after the story appeared on the Haaretz Web site, the IDF said it would allow the Israeli Arabs to enter Gaza early Friday. A U.S. nightmare? Leftist Indian may lead Bolivia : The son of a highland peasant and a one-time coca farmer, Morales carries a message that is reverberating with Bolivia's poor Indian majority: nationalizing the country's gas industry and challenging Bolivia's free-market economic policies. He has also invoked racial imagery in urging Bolivians to choose their first indigenous president over European-descendants who have led the country for decades. Intelligence on Vietnam War 'faked' : One of America's top spy agencies faked key intelligence used to justify its intervention in the Vietnam War, it has been revealed. But the revelation was kept secret by the National Security Agency, partly because of fears that it would boost criticism of the intelligence services over the war in Iraq. According to material uncovered by the NSA's own historian, Robert Hanyok, middle-ranking officers altered material relating to the Gulf of Tonkin incident. July 7 Tube bomber argued with cashier shortly before blast : New details of the behaviour and last movements of the four suicide bombers, who killed 52 people, were disclosed by a representative of the Metropolitan Police Anti-Terrorist Branch, the magazine Police Review has reported. "I've seen the CCTV footage of these people. They do not appear to be on their way to commit any crime at all. The Russell Square bomber [Hasib Hussain] is actually seen going into shops and bumping into people [prior to his attack].We have been told in the past that the normal age [for a terrorist] is about 30 ... that profile is totally wrong.Fresh details about the apparent confusion and disorientation of the youngest bomber, Hussain, follows the disclosure that he left the Underground system and wandered around the King's Cross area - at one point he was filmed going into a McDonald's take-away - before setting off his bomb on a No 30 bus in Tavistock Square, killing 13, more than an hour after the other terrorists had detonated their devices on the Tube trains. Bristoloian 108 : (pdf) recently nominated for the new posthumous Paul Foot Award for investigative journalism. Amira Hass - How the PA failed : The PA, as opposed to Iceland or Bangaladesh, is neither a country nor a state. It is a bureaucratic-political system with limited administrative and governmental authority over a population of approximately three and a half million people. It has no authority or control over central elements that define a people's sovereignty: land, water, minerals, borders, freedom of movement, freedom to make decisions such as change of address and the right of residence for non-citizens, the awarding of citizenship, and the entry of tourists. An Israel Defense Forces soldier at an out-of-the-way checkpoint has more say in these matters than the PA. For example, last Sunday IDF soldiers at the Beit Furiq checkpoint east of Nablus prevented the passage of Palestinians between the ages of 16 and 30 until further notice. That was the order, the soldiers made clear. Among those whose passage was prohibited were school children, students and people on their way to work in Nablus - the IDF does not define work and studies as "humanitarian needs" that would allow the soldiers flexibility in interpreting their orders. Robert Fisk on reporting Iraq : "A few weeks ago, I went to see a man whose son was killed by the Americans, and I was in his house for five minutes before armed men turned up in the street outside. He had to go and reason with them not to take me away. And this was an ordinary Baghdad suburb, not the Sunni Triangle or Fallujah. It has got to the stage where, for example, when I went to have a look at the scene of a huge bomb in a bus station, I jumped out of the car and took two pictures before I was surrounded by a crowd of enraged Iraqis. I jumped back in the car and fled. I call that `mouse journalism' - and that's all we can do now. If I go to see someone in any particular location, I give myself 12 minutes, because that is how long I reckon it takes a man with a mobile phone to summon gunmen to the scene in a car. So, after 10 minutes I am out. Don't be greedy. That's what reporting is like in Iraq." IRAQ: Civilians killed near al-Qaim in air strike, doctors say : Dozens of civilians including women and children were reportedly killed in US air strikes on Monday near the western Iraqi town of al-Qaim, some 12 km from the Syrian border, local doctors said. The Bush Family Cookbook : The recipes in your new book, "The Bush Family Cookbook," are surprisingly fattening. The Bush family recipe for mixed-vegetable casserole, for instance, combines frozen peas and green beans with three cups of mayonnaise and heavy cream. Isn't that unhealthful?